Cathedral School of Saint Mary is located at 910 San Jacinto Blvd., between 9th Street and 10th Street in downtown Austin. The entrance to the parking garage is located off San Jacinto Boulevard. You can park in the parking garage behind Cathedral School. 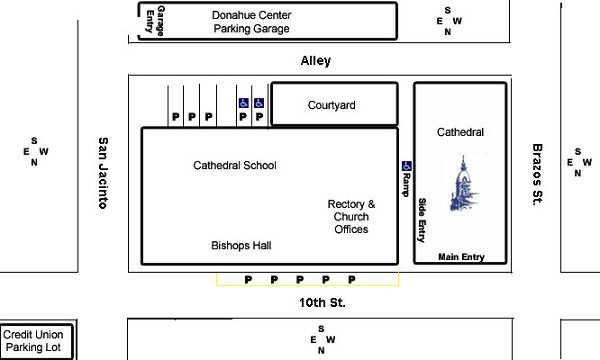 Parking is free for Cathedral School visitors; just remember to bring your ticket to the school office for validation. The entrance to the school is located on San Jacinto Street. The alley behind Cathedral School has handicapped parking and a few weekday visitor parking spots. Streets surrounding Cathedral School on all sides are lined with parking meters, which are free before 8:00 AM. By bus: Click for Capital Metro Trip Planner to Cathedral School of Saint Mary!